This is my bedroom, it had a kitchen in it. All gone now. 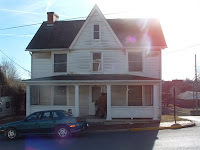 Pic below is of my scary house. Was white now green with flowers abounding. I started out melancholy today, feeling a bit sorry for myself. boo hoo I say. 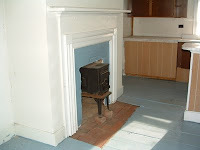 My house is very old. 150+ years old. To make matters worse, I live on a corner with two streets. One in front of my house and one beside my house. The dirt and dust from living here is unbearable. It's not gray/white its brown/black dirt and dust and no matter how hard I clean, it NEVER LEAVES!!!! We have been renovating for over 4 years and I'm sooooooooooooo done. The main bathroom has a very, very old nasty shower stall in it. Yep I haven't had a bath in 4 years. Scary huh! But even in the mist of all this there is blessings. I was afraid to move into the city and fought my husband tooth and nail. I was worried for my kids safety and we have had some problems. But God has kept us safe. I have 130lb Rottweiler and she has already protected us from a drug frenzied girl. This girl came into our house high as a kite and laid on our sofa to sleep her drug high off. My Rottie simply laid on top of the girl and would not let her move. I still laugh about it to this day. As I sat in my chair starring at one of my many wonderful magazines, a woman knocked on the door. She thanked me for giving her granddaughter my daughter's old mattress. She started talking to me about the Lord and I just smiled. God is so good. He knows just when to bring an angel in your day doesn't he?!? I asked her about her bag she was carrying. She had made it herself. I was just looking at bags in my magazine and was thinking about offering those in my soon to be updated selling blog. She asked me if I new how to help her sell them for extra cash. I just smiled again. How does God do that????? He is amazing. God has blessed me with wonderful neighbors. My neighbor on the left is now my best friend. My neighbors on the right are of a different race and they have become good friends as well. God doesn't care what color they are does he, why should I? God is so good. So I am now out of that dark, self brooding pit I woke up with and am blessed and thankful once again. Thanks so much Lord, you are always on time. Pics by: Lauren Gray, age 16. OK, so I'm a little late telling ya'll about my listings on Lemon Poppy Seeds. Well I do have a life, LOL! At least that is what I'm calling it these days. This first listing is my Liberty Lady. She is made from Osnaburg fabric and is nice and prim. She is a Snugglebug Blessings original, created by me, Cathy Gray. Okay, enough of the blah, blah blahs. She's a cutie for sure. Lighting the way for Liberty for all. 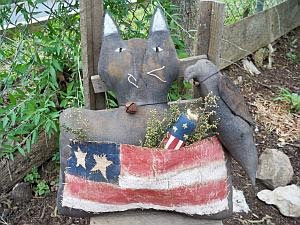 The next one is Americana Kitty and her crow. Pattern design by Tennessee Ridge Primitives. I just love how this kitty came out. Really meowing I love America!!! Don't you?!? She's made of muslin and has some of that wonderful Sweet Annie tucked inside her pocket. I shot this pic in my new garden bed. Creating that bed has put a crick in my back and neck. But the garden turned out really nice! I'll have to take some pics of that later to share. The wind was whipping when I took this pic, it was impossible to get a shot of the kitty's whiskers laying flat. But the pic still came out pretty good despite the wind. Hope you get over to LPS's for a gander. Lots of goodies there for you to see. Have a wonderful, creative day! Well it's been a very long time since I have blogged. My computer had viruses and it was very sick. The computer doctor did fix it thank the Lord. So many unhappy things have happened to me lately but I will not go into it. It is Mothers day soon and it is time to celebrate a wonderful gift God has given us, Motherhood! I have 2 wonderful children, a 16 year old daughter and a 8 year old son. They are truly a blessing to me. Now I have to tell you my daugther is 16 going on 25. She thinks that she can move out now and still go to school, hold a job and head off to college. Is anyone heeheeing yet? We know as mothers that it is wayyyyyyyy to soon for her to do that. She is putting the cart before the horse so to speak and she just isn't ready. Now convincing her is another story. It doesn't matter because she is under age and we won't sign for an apartment for her. NO WAY, NO HOW!!!! My son still holds that sweet inocence and wonder. I love when he comes home and runs to tell me how his day went. Sometimes I forget that this is very important to him and am busy. That is a big no, no for me and will try harder not to put stuff in front of him. My favorite saying of his is Mom, Mom, you know ............ then he proceeds to tell me what wonderful thing he has discovered or learned. Can't I bottle that????? I love that so much, that sweetness. I know that many of you have similar stories to tell, many are happy some are sad, but God is with us and has given us these wonderful treasures. So I say to you treasure them, hold them, love them, then let them go......when they are really ready. Happy Mother's Day!